Hi, I'm back! I have more graduation cards to share with you. Most people give gift cards or money for graduation presents. For that reason it is good to have a pocket inside the card to hold it. This next card is created to hold some bills. You can get the measurements and tutorial for the base card here. 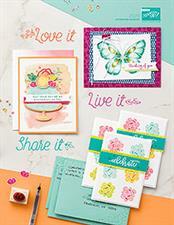 You can make a matching envelope to fit the card with the envelope punch board. Pretty easy! The graduation cap is made with the 1" square punch. I cut strips in a piece of the daffodil delight seam binding ribbon to get the tassle and attached it with a silver brad. We don't have any big graduations this year but we will have a bunch next year! Next year my son, Nick, graduates from high school and my daughter graduates from college. Scary! And they have 2 cousins graduating from high school and of course a bunch of friends graduating too. I better get a jump on making cards for all of them. It's not too early to get started! 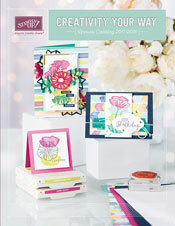 I will have the new catalogs with me too! Contact me if you want to reserve one. Hi stampers! I'm still here. If you are reading this then you are too. Thanks for hanging with me! My neighbor, Jennifer, commissioned me to make a couple of graduation cards for her niece and nephew. We found their school colors and she wanted cards to put money in so I set to work. I don't really have many graduation stamps so I stretched myself a bit. The owl punch is a favorite tool for graduation cards because you can make the owl into a graduation owl with a little graduation cap and a diploma. Here is what I came up with. I altered the owl punch a bit. I punched out the owl in chocolate chip cardstock. Punched it out again in pumpkin pie cardstock. Then I cut off the feet and glued the pumpkin pie ones underneath the body. The wings are 1/2 of the circle scallop punch. I added bigger eyes than the owl punch gives you. I did 1/2" circles with the eyelids in the same size just with the circle cut in half. The inside eyeball is from the owl punch. For the graduation cap I started with the 1" square punch and hand cut it down into more of a diamond shape. This took a few tries. I popped the graduation cap up with some Stampin' dimensionals. Then I added the circle in the middle of the cap with the uniball gel pen and added accent marks to the pupils with uniball as well. The diploma is some designer paper with words on it that I rolled up and tied with the linen thread. You only need a tiny piece of paper. Make sure you distress it with your bone folder for easier rolling. I made an inside pocket by cutting a 2 1/4" piece of cardstock, punching a 1 1/4" circle(half way in) to have somewhere you can grab the gift card or money. I adhered the sides with sticky strip. One and done! I have a couple more graduation cards I made that I will share on a later post. If felt so good to get back in my craft room(even though it's a total disaster and not very functional). My husband tells me he will start working on building me my new craft room when we get back from our trip to Minnesota. Yippee! Thanks for stopping by today! I will see you soon.